In this adaptation of the classic Lode Runner, you play as Mugurukun, as he collects the building materials found on each stage. 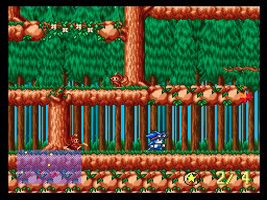 Enemies wander about the stages. Mugurukun's only defense is to blast holes in the ground. If enemies become trapped in the holes, they can be passed over safely. Be careful not to trap Mugurukun in a hole, however, or the stage will have to be restarted.